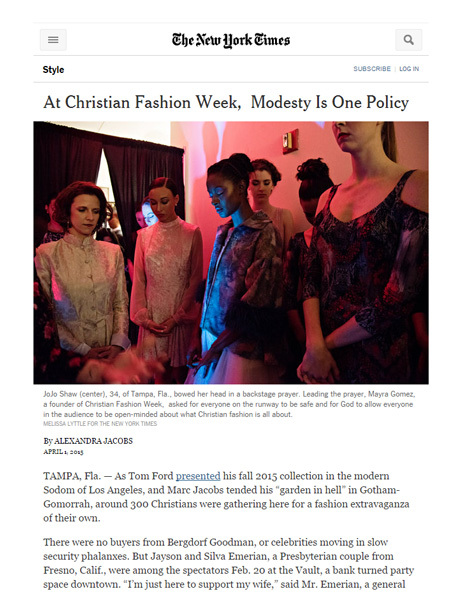 Keep up with the latest from Christian Fashion Week. Our blog is an information source for all things CFW and any news from the fashion industry that affects the Christian market. We are so excited to be featured in the New York Times today! Domestic correspondent for the Styles section of The New York Times, Alexandra Jacobs, tell the story behind the scenes at Christian Fashion Week 2015. The article discusses the people behind the show as well as the philosophy and culture of our mission. Jacobs also discusses the strange struggle we have with the contemporary modesty teachings and how Christian Fashion Week is looking beyond the shallow and into things closer to the heart of God. Thank you to everyone who interviewed and gave Alexandra the information she needed for her article. Special thanks to the New York Times and Alexandra herself for the support and exposure. We truly appreciate it and are humbled that you found us newsworthy. Read the the full article!